We used the ground truth location of people in the video to crop each person, then we created a directory containing samples of each person (p0?? – p0??) for each video sequence. The samples in the directories have the original size, but in our experiments they were resized to 32×64 pixels. In our experiments, we chose one of the samples of each person to learn the appearance-based model and the remaining samples for classification (this procedure was repeated few times and the average was used). The results were given by the overall recognition rate. 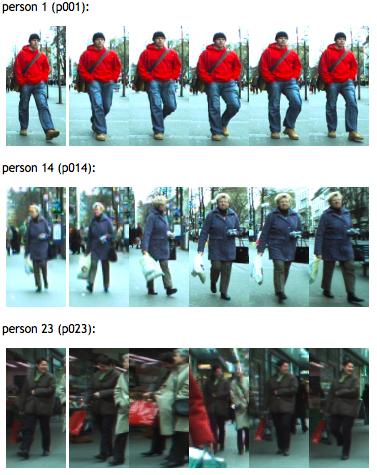 Next figure shows few examples of cropped samples contained in the first video sequence of the dataset. Schwartz, W. R.; Davis, L. S. (2009): Learning Discriminative Appearance-Based Models Using Partial Least Squares. In: Brazilian Symposium on Computer Graphics and Image Processing, 2009. The samples used in the experiments were obtained from the ETHZ dataset, containing three video sequences used in the paper Depth and Appearance for Mobile Scene Analysis. A. Ess and B. Leibe and L. Van Gool. ICCV’07, so you also need to cite their paper when using this dataset (see instructions here).